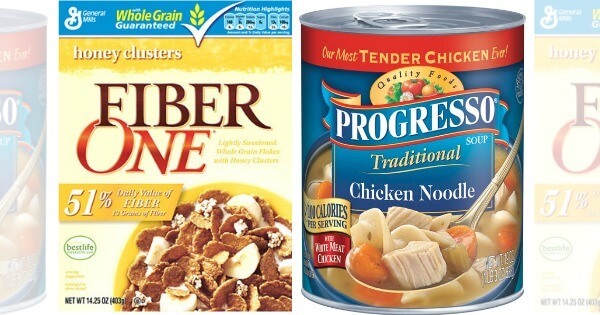 $3.65 in New General Mills Coupons – Free Progresso Soup at ShopRite + More Great Deals! We have some new General Mills Coupons available to print. These coupons switch over every Thursday so check back each week for new offers! To access the coupons you will need to be signed in to your Betty Crocker account (or sign up). Once signed in, click on coupons on the top right. Just note, these coupons have a print limit of 1 per computer. Through 1/9, ShopRite has Progresso Classics soups on sale for $0.98 each making it FREE after the coupon. Starting 1/8, Stop & Shop will have Progresso Vegetable classics soups on sale for $0.88 making it free each after coupon. Check out some more great deals you can score with these new coupons as well! 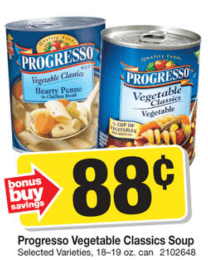 Progresso Vegetable Classics - $0.98 Free! Progresso Rich & Hearty, Traditional or Vegetable Classics Soup, 18-19 oz. – Light, Reduced Sodium or Regular - $0.99 Free! 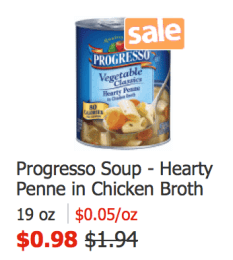 Progresso Soups - $0.88 Free! Money Saving Tip: Check the Grocery Price Comparison Tool to find the best deals on this product at your local stores. $5 in New Nice! Brand Coupons – Toilet Paper Just $0.25 Per Roll at Walgreens!